Click the "Help" menu label at the top of the main window. The Help menu provides quick access to this help documentation, the ability to check for updates or send feedback, and links to the VueMinder website and forums. There are two versions of the help menu, depending on whether VueMinder has been registered. After registering, the "Buy VueMinder" command is replaced with "About VueMinder". Also, the "Buy VueMinder USB" command enables licensed Pro or Ultimate users to receive a 50% discount on the USB version. Launches a web browser window to display frequently asked questions about VueMinder. This will open the VueMinder blog in a web browser. The blog is your source for the latest how-to articles and announcements. This will open the VueMinder forums, enabling you to interact directly with the VueMinder development team and user community. This will launch your default email client with a template that enables you to either send a bug report or provide feedback regarding VueMinder. If you are submitting a bug report, please include some basic information about what you're seeing, so our support staff can better assist you. You will receive a response within 24 hours, and sometimes much sooner. This command is shown in the Pro version. After registering, if you choose to upgrade to the Ultimate version you can use this command to receive up to a 50% discount. The Ultimate version adds a number of features, including the ability to define custom data fields and share tasks, notes, and contacts over a local network. A more detailed comparison can be found here. This command is shown in the unregistered Pro version. 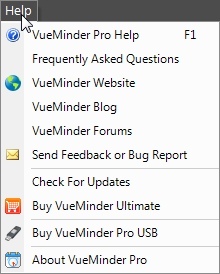 Clicking this command will display the Buy VueMinder window, where the program can be purchased. This command can be used to purchase the USB version, which can be used in confunction with the regular version to provide access to your data when you're away from your main computer. You can run the USB version on any Windows computer from a USB stick, without needing to install the software. All data is stored in the location where the USB version runs. When this command is clicked after the regular Pro or Ultimate version has been registered, it will provide a 50% discount on the USB version.